Leading this morning’s inequality watch is this item from the 538 significant digits email. Just in case you missed that last part, let me flag it for your attention House Republicans approved a plan that endorsed the White House’s decision. It is critical, come November, to flip the House. Politico reports Trump cancels pay raises for almost 2 million federal workers. ‘In light of our nation’s fiscal situation, federal employee pay must be performance-based,’ the president wrote in a Thursday letter to congressional leaders. "We must maintain efforts to put our nation on a fiscally sustainable course, and federal agency budgets cannot sustain such increases,” the president wrote in a letter to congressional leaders. Under Trump’s policy, roughly 1.8 million people wouldn’t get an automatic pay boost next year, including Border Patrol and ICE agents. That stance puts vulnerable GOP lawmakers representing northern Virginia — home to tens of thousands of federal workers — in the political crosshairs. And it sets up an all-but-certain funding fight with Congress next month, as party leaders attempt to reach a sweeping agreement to keep the government open before the start of the next fiscal year on Oct. 1. Sure, Donnie. You have the brass to defend shafting a few more workers after signing off on a tax cut that benefitted corporations and wealthy Americans and increased our national debt? Considering the larger picture of inequality, Judd Legum at popular.info reveals America’s dysfunctional economy, in one chart. In recent speeches, Trump has “falsely claimed that wages are going up for the first time in 18 years, 19 years, 20 years, 21 years and 22 years." Let’s hear a long, slow clap for big money interests. They showed again this week who really runs Arizona. That became clear Wednesday as the Arizona Supreme Court handed down rulings on what initiatives will and won’t appear on state ballots this November. The legal challenges to the proposed ballot issues all had their own individual sets of reasons. But the outcomes in every case were that big money won. The Invest In Ed initiative would have raised the income tax rates on individuals making more than $250,000 per year or couples making more than $500,000 per year. The authors estimated $690 million in new money would go to the K–12 education system as a result. But the Arizona Chamber of Commerce and Industry, which often doubles as a political defense group for the wealthy, opposed the initiative. It noted how the initiative’s language referred to the increases in tax rates as “percent” increases, when they really should have been called “percentage point” increases, or the percentages should have been much bigger. It was a bad mistake by the initiative’s authors, and the upshot was that about 270,000 people who signed petitions lost. The Arizona Chamber, and those who might have paid higher taxes, won. The Outlaw Dirty Money initiative was especially offensive to wealthy interests because it would have forced them to disclose the political spending they use to maintain control in Arizona politics. Three dark-money groups challenged the initiative. Of course they did — it challenged their reason for being. Their attorneys issued subpoenas to 15 petition circulators who gathered signatures for the initiative. When those circulators didn’t show up, a 2014 law required that the signatures they collected be invalidated. The Supreme Court’s decision Wednesday affirmed the constitutionality of this law, which was designed to make it harder for citizens to get initiatives on the ballot. So, as a result, the signatures of 285,786 Arizona voters have been thrown aside, and the wealthy get to plow their money in our elections without the inconvenience of having to acknowledge it. Some big money likes clean energy. Other big money hates clean energy. In the Clean Energy initiative case, big money would have won no matter which way the court turned, because big money both backed and opposed the initiative. This initiative would require Arizona utilities to get 50 percent of their energy from renewable sources by 2030. Arizona Public Service used its monopoly power and money to oppose the measure, and California billionaire Tom Steyer used his piles of cash to support it. Bob Lord at Blog for Arizona reminds us that Reality Calls: Kyrsten Sinema May Be the Most Important Vote You Ever Cast. Here it is in full. Scriber weighs in: If you stay home, you get McSally. If you vote Green or Libertarian, you get McSally. You can continue to be a progressive, but you need to get practical. She “who repeatedly pledges fealty to Trump, is a thousand times worse” than Sinema. Here are some samples of what I’ve posted in the recent past. From my June 13, 2018 post: Research report - Krysten Sinema’s votes reveal progressive values. For Sinema’s record in the U. S. House, I used 538’s Tracking Congress In The Age Of Trump. An updating tally of how often every member of the House and the Senate votes with or against the president. One measure is “how often a member votes in line with Trump’s position.” Sinema scores 57.3% and is the third highest Democrat in the House in voting with Trump. Instead of using the overall percentage we need to look at votes on legislation that matter to progressives, for example, denying funding for Planned Parenthood, punishing sanctuary cities, increasing the availability of guns, repeal of Dodd-Frank, and repeal of regulations that provide for clean air and water. I pulled the records for 33 such bills from January 1, 2017 to present. I counted the number of instances in which Sinema voted against legislation supported by Trump. Her score was 85% opposed to Trump’s position. At the time of this writing, it appears that a likely match-up for the AZ U. S. Senate seat will be between Sinema and McSally. When it comes to deciding on how to vote, if you want ideological purity, you could point to the difference between Sinema and Grijalva (100% - 85% = 15%) and stay home. But if you want to flip that seat held by Republican Jeff Flake to a Democrat, you should focus on the difference between Sinema’s progressive score vs. that of McSally (85% - 3% = 82%) and Get Out to Vote. The authoritarian dictator, Donald J. Trump, has a history of threatening violence against those who disagree with him, or even just reporting on his rallies. That history includes his urging members of his audience to take violent action against the press and others in attendance. If you are reluctant to believe that, here are the results of some fact-checking by snopes.com. Did Donald Trump Encourage Violence at His Rallies? asks Snopes.com. The fact-checking reveals that A viral cartoon accurately presents several quotations by the then-presidential candidate, delivered on the campaign trail in 2015 and 2016. Donald Trump faced criticism during his successful 2016 presidential campaign based on the aggressive atmospheres of many of his rallies, where tension and intimidation repeatedly spilled over into violence. Some of that violence has resulted in lawsuits. In one ongoing suit, Kentucky protesters who attempted to disrupt a rally in March 2016 are suing the president in federal court for incitement to riot after he urged “Get ’em out of here” from the stage, upon which members of the crowd attacked and forcibly removed the protesters. 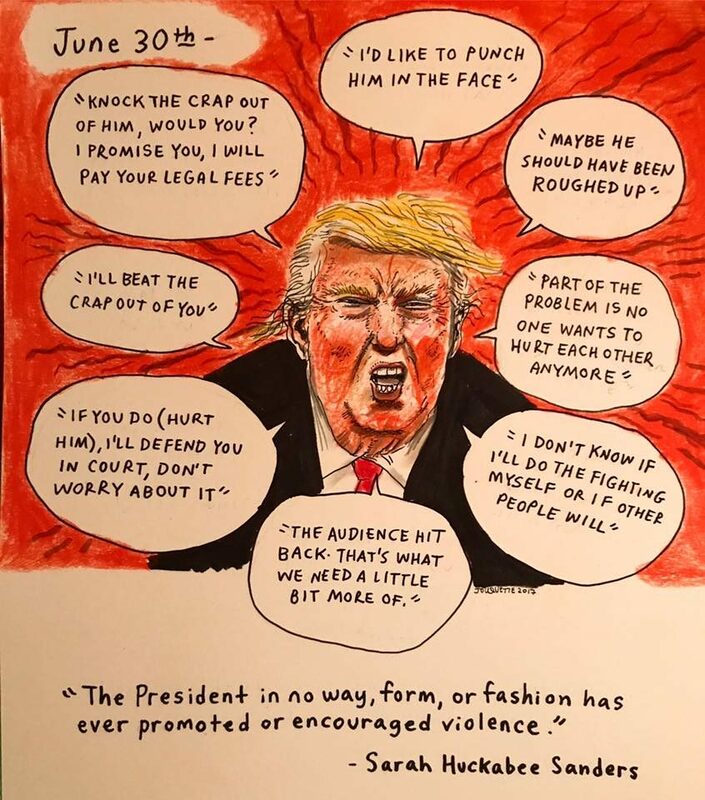 As part of these criticisms, a cartoon emerged in June 2017 which appeared to accuse White House Press Secretary Sarah Huckabee Sanders of misinforming the public about Trump’s record on encouraging or condoning violence. The cartoon has been shared numerous times since June and resurfaced in February 2018, when it was posted by the Impeach Trump Facebook page and tweeted out by singer/actress Bette Middler. The cartoon was rarely credited to its creator, the illustrator Jesse Duquette, who publishes The Daily Don, a series of cartoons about the presidency of Donald Trump. Duquette first posted the cartoon to Facebook on 30 June 2017. We’ve received many inquiries from readers about the authenticity of the quotations featured in the cartoon, and they are all statements made by Donald Trump. Although each is presented in isolation, they fairly reflect the context in which Trump uttered them. Snopes goes on to provide the video clips documenting each of the utterances claimed in the cartoon. Recall the old psychological adage: The best predictor of future behavior is past behavior. Sure enough, Trump went on an even worse tirade in a meeting with Christian leaders. He said a lot more that comports with his history of incitement. Here are snippets from the NBC report. In a closed-door meeting with evangelical leaders Monday night, President Donald Trump repeated his debunked claim that he had gotten “rid of” a law forbidding churches and charitable organizations from endorsing political candidates, according to recorded excerpts reviewed by NBC News. Assuming “they” refers to Democrats, what does he expect that “they” will do? Will “they” undo what Trump has done, like enact laws that harm the health and welfare of working families? Sure. But as Rep. Elijah Cummings said, "One thing I’m not looking for is retribution,” … “I’m just trying to get to regular order, I swear to God.” In other words, we can look forward to a return to our democratic values and practices. What if Trump loses in 2018 or 2020? Given his impulsivity might he actually shoot someone as he has contemplated, hypothetically? The NY Times author Thomas Friedman says Your vote in the midterms matters, because Republicans in Congress won’t restrain the president’s excesses. If Trump actually did shoot someone, what would be the reaction and by whom? Friedman imagines the consequences. [In the Cold War,] Because the Soviets claimed to have built a worker’s paradise, it was important that we had strong unions, a strong middle class, less inequality and an adequate social safety net. The Soviets did not have the rule of law. So we had to have it more than ever. Donald Trump flouts the Constitution, raking in money from supplicants who curry favor with him by patronizing his gaudy hotels. Congress is silent. The president’s commerce secretary, Wilbur Ross, was accused of effectively stealing more than $120 million in various schemes — Forbes described him as possibly one of the “biggest grifters in American history.” It barely registered in the headlines. ProPublica reported that a trio of random Trump cronies with neither military nor government experience is secretly running the Veterans Affairs Department out of Mar-a-Lago. Republicans have made no plans for hearings. The president’s former lawyer testified that Trump directed him to commit felonies to cover up alleged affairs in advance of the election. The shock lasted about 48 hours. This culture of impunity is less a result of Trump’s political skill — he’s deeply unpopular — than of one-party rule. The majority of voters want a check on this administration, but the Republican Party doesn’t care; it’s beholden to a minority that delights in the helplessness of fellow citizens. If Democrats take the House in the November midterms — which the model of the statistics website FiveThirtyEight gives them about a 70 percent chance of doing — that helplessness ends. Contrary to Republican claims, there are no Democratic plans for imminent impeachment proceedings. But there will be subpoenas, hearings and investigations. Things that haven’t mattered for the past 19 months suddenly will. Still, Republicans are right to be worried. But regular order entails a level of accountability that the Trump administration has never faced. Adam Schiff, who is poised to lead the House Intelligence Committee if Democrats win a majority, plans to renew the committee’s investigation into Russia’s role in the 2016 election. (He insists that for Democrats, the investigation never stopped.) Schiff said he’ll look at the work being done by Robert Mueller, the special counsel, and by the Senate Intelligence Committee, and figure out where the gaps might be. “One that I would put as very important is the issue of whether the Russians were laundering money through the Trump Organization,” he said. If Democrats prevail in November, his committee won’t be the only one examining Trump’s finances. Under a rarely used 1924 law passed after the Teapot Dome scandal, leaders of three congressional committees — the House Ways and Means Committee, the Senate Finance Committee and the Joint Committee on Taxation — can each demand to see the president’s tax returns. “You’re not going to find out whether this president put the United States in jeopardy because of his financial dealings unless you get his tax returns,” said Bill Pascrell, a New Jersey Democrat who sits on the Ways and Means Committee and has made obtaining Trump’s tax returns a signature issue. Over the last 19 months, we’ve heard the phrase “This is not normal” a lot. If Democrats lose in November, it will remain an impotent mantra of the resistance. If they win, it becomes an accusation backed by subpoena power. President Petulant insults Senator McCain, stonewalls ABC's Jon Karl. Rachel Maddow responds - and, oh boy, does she ever. ABC News’ Jon Karl is relentlessly following Trump around to ask about John McCain. Trump is stonewalling him. President Trump Petulant has been uncharacteristically quiet about the late Sen. John McCain, and one White House reporter has been on a mission to change that. Jon Karl, ABC News’ White House correspondent, spent part of his Monday afternoon documenting just how doggedly he was asking Trump about McCain’s legacy. With similar resolve, Trump seemed determined to face stoically ahead, ignoring every single one of Karl’s questions. One more,“ Karl wrote a few minutes later. ”I asked the president to respond to the American Legion calling for a McCain proclamation and the lowering of the White House flags. No answer." The American Legion, a veterans’ organization, demanded Monday that Trump issue a formal proclamation about McCain’s death, and requested that he order the flags at half-staff until McCain’s burial in keeping with presidential protocol. Trump, who once called McCain “very foul-mouthed” and frequently criticized the senator, has not commented since his initial tweet, in which he simply offered “deepest sympathies” to McCain’s family. … it would’ve cost Trump nothing if the White House had issued a dignified written statement celebrating McCain’s life. The president wouldn’t have had to write it, read it, or even agree with it. The statement would’ve made Trump appear gracious toward an occasional critic. But the small, petty man in the Oval Office just couldn’t bring himself to even pretend to be dignified. Last night, Rachel Maddow had a scathing, on-line rebuke to President Petulant. The video is embedded below but, if that does not play for you, here is the direct link. Here’s a choice selection from the popular.info email newsletter. Axios’ Jonathan Swan obtained a list being circulated by Republicans detailing the investigations that Democrats will likely launch if they recapture the House of Representatives. The clear purpose of the list is to motivate Republican voters to turn out in November. The real news here, however, is not that Democrats would investigate these issues. It’s that Republicans don’t believe any of these issues are worthy of investigation. And because of the incredible indifference shown by the president to the corruption evidenced in the list, there is no real preparation for the coming onslaught. Here’s the Axios summation. The spreadsheet — which I’m told originated in a senior House Republican office — catalogs more than 100 formal requests from House Democrats this Congress, spanning nearly every committee. For context, when Republicans were in power, they investigated Socks, Bill Clinton’s cat. The Economic Policy Institute reported earlier this month that the average CEO of the 350 largest firms in the U.S. pocketed $18.9 million in 2017, a 17.6 percent pay increase over 2016. At the same time, typical worker compensation remained flat, rising merely 0.3 percent. If you do some quick math, dividing 17.6 percent by 0.3 percent, you might conclude that CEO pay in 2017 increased about 60 times faster than worker pay. But if you take a moment and do some more careful calculations, that CEO-worker pay gap will soar incredibly higher — to a CEO pay boost over 15,000 times the pay hike for workers. Let’s go through the arithmetic. In 2016, before the latest whopping CEO pay hikes, America’s top executives were already making 270 times worker pay. So for each dollar of worker pay that increased by 0.3 percent between 2016 and 2017, $270 of CEO pay increased by 17.6 percent. To visualize this a bit more simply, let’s compare a CEO paid $9,000,000 in 2016 with a worker at the same corporation paid 1/270th as much as that CEO, or $33,333. A 17.6 percent increase for the CEO would translate to a tidy $1,584,000 pay raise. Not bad work if you can get it, huh? On an hourly basis, our lucky CEO saw his pay increase by $792, from $4,500 per hour to $5,292 per hour. And the worker? A 0.3 percent increase over a $33,333 salary would translate to a whopping $100 raise. That’s right, a little under $2 per week. The bottom line: Our CEO saw a pay increase 15,840 times the pay boost our worker received. In other words, for every additional dollar our average worker earned in 2017 compared to 2016, our average CEO took home an additional $15,840. Another perspective on our numbers: After one hour of labor in 2017, our CEO grabbed a pay increase over the previous year nearly eight times as much as the increase our worker received for the entire year. So to put it another way: The CEO’s raise was $792 per hour while the worker’s raise was a mere $100 per year! A local campaign sign asserts that the candidate is a “principled conservative.” Does that imply that there are UNprincipled conservatives? There are a couple of things covered in this post. First, there is a general charge that, with respect to Trump, “Everyone and everything he touches rots.” Second, there is a story about a Republican candidate for the AZ U. S. Senate Seat now occupied by Jeff Flake, Kelli Ward, a story that might have been penned by New Yorker satirist Andy Borowitz - but it is the real deal. The GOP rot does not stop in DC. There’s never been any confusion about the character defects of Donald Trump. The question has always been just how far he would go and whether other individuals and institutions would stand up to him or become complicit in his corruption. When I first took to these pages three summers ago to write about Mr. Trump, I warned my fellow Republicans to just say no both to him and his candidacy. One of my concerns was that if Mr. Trump were to succeed, he would redefine the Republican Party in his image. That’s already happened in areas like free trade, free markets and the size of government; in attitudes toward ethnic nationalism and white identity politics; in America’s commitment to its traditional allies, in how Republicans view Russia and in their willingness to call out leaders of evil governments like North Korea rather than lavish praise on them. But in no area has Mr. Trump more fundamentally changed the Republican Party than in its attitude toward ethics and political leadership. For decades, Republicans, and especially conservative Republicans, insisted that character counted in public life. They were particularly vocal about this during the Bill Clinton and Monica Lewinsky scandal, arguing against “compartmentalization” — by which they meant overlooking moral turpitude in the Oval Office because you agree with the president’s policy agenda or because the economy is strong. Not any more. Graham is just as submissive as the rest of the cowardly Republican senators. The greatest damage is being done to our civic culture and our politics. Mr. Trump and the Republican Party are right now the chief emblem of corruption and cynicism in American political life, of an ethic of might makes right. Dehumanizing others is fashionable and truth is relative. (“Truth isn’t truth,” in the infamous words of Mr. Trump’s lawyer Rudy Giuliani.) They are stripping politics of its high purpose and nobility. That’s not all politics is; self-interest is always a factor. But if politics is only about power unbounded by morality — if it’s simply about rulers governing by the law of the jungle, about a prince acting like a beast, in the words of Machiavelli — then the whole enterprise will collapse. We have to distinguish between imperfect leaders and corrupt ones, and we need the vocabulary to do so. Most Republicans, having thrown their MAGA hats over the Trump wall, will stay with him until the end. Was a tax cut, deregulation and court appointments really worth all this? Mr. Wehner served in the previous three Republican administrations and is a contributing opinion writer. Scriber reminds said “Most Republicans”: You do not want to be the last rat on the sinking ship. (2) AZ GOP Candidate Kelli Ward Says McCain Died to Harm Her Campaign. Every time I think Trump’s GOP couldn’t possibly sink into depravity any further, I get another reminder of just how far they’ve fallen. John McCain announced he was ending treatment and accepting his fate on Friday, August 24. This upset Kelli Ward because this “negative narrative” was clearly planned to interfere with her pointless bus tour. How devious of him. She complained about this on Saturday. I guess McCain then decided to really turn the screws to her, because he passed away a few hours after she made that idiotic statement. That twisted Fake News media and their agenda. They are the ones pushing the narrative that Kelli Ward is a heartless moron by unscrupulously… providing a screen grab of exactly what she said? When did her campaign become a Simpsons parody? Or, adds Scriber, a parody written by New Yorker satirist Andy Borowitz. On her bus tour, after McCain’s announcement of his impending death, Ward continued to insult and bash him. Before the bus tour, Kelli Ward was openly suggesting that she should be appointed to the Senate seat upon McCain’s vacancy. Even the governor found this tasteless and said no way. Trump has entirely revamped the GOP in his image. We now have right-wing candidates who follow his lead on degrading people, lying, and refusing to apologize under any circumstance. Here in Florida, just this month, we had a Trump candidate who faked a diploma, another who said his Muslim constituents provided no benefit to society, and a gubernatorial candidate who insulted Puerto Ricans. The common thread with all of them is that they all refused to admit they were wrong. They all doubled-down and/or blamed the “Fake News” for reporting on their behavior. McSally has flipped on just about everything to where she now votes with Trump 97.8% of the time. McSally and Ward are the two leading GOP contenders to represent Arizona as a United States Senator. If you are a principled republican and can’t stomach either of them, there’s always Joe Arpaio. Or you can join us until your party regains its sanity. Mournday Mourning Illustrated Gnus from AZBlueMeanie at Blog for Arizona: Rambling Rudy and other creatures of the swamp. We can’t get Trump for shooting someone in Times Square, but, like Al Capone, how about crooked finances? Rambling Rudy: Guilt isn’t Guilt. AZ, CA, and FL all offer sand to Trump supporters looking for places to bury their heads. DeVos promises a gun for every teacher, Ed Dept budget insufficient for school supplies. So, Rudy, is what Trump supporters believe not what they believe? Trump’s EPA (Extreme Profits Always) is about to make “change that could breathe new life into scores of aging coal power plants.” The thing is, that change is also likely to come at a cost of human lives due to increased pollution from burning coal. First, what’s the change? Tucked inside the Trump administration’s plan to ease carbon dioxide limits is a change that could breathe new life into scores of aging coal power plants. Experts say the shift could also unleash an additional tens of thousands of tons of nitrogen oxide emissions into the air each year. The proposal would permit upgrades to old power plants without triggering an existing legal requirement to install costly pollution control systems at the same time. The upgrades could extend the lives of those plants by making them more reliable or cheaper to run. For coal power plant owners, “this proposal seems to want to let them have their cake and eat it too: to improve their efficiency, run more often and not trigger” the requirements, said Andres Restrepo, a staff attorney with the Sierra Club. More than a third of American coal-fired units lack modern controls to pare smog-forming nitrogen oxide emissions, according to a Bloomberg News review of Environmental Protection Agency data. Some of those plants went into operation in the 1950s and 1960s, predating advanced catalytic-reduction equipment and regulatory requirements compelling its use. All told, at least 33 percent of electricity generated by burning coal last year was not subjected to advanced pollution controls, according to EPA data. For years, owners of those aging facilities have faced a major challenge: The plants might benefit from equipment replacements and upgrades that would make them more reliable and less costly to run – and better able to compete with natural gas-fired units. Yet any change that would bolster nitrogen oxide emissions by 40 tons a year – perhaps just because the plants would run more as a result of the upgrades – would also trigger requirements to install modern controls to keep those pollutants at bay. President Donald Trump’s EPA is offering a revision as part of its proposal to replace an Obama administration regulation slashing carbon dioxide emissions across the nation’s electric grid with modest requirements for efficiency upgrades at individual power plants. At issue is the federal government’s so-called New Source Review program, which allows power plants, refineries, factories and other industrial facilities to keep running with existing pollution-control equipment – even if it has become outdated – so the systems don’t constantly need upgrades. Under the New Source Review program, requirements for better pollution-control systems are triggered whenever the sites undergo construction, renovations or some operational changes expected to significantly boost annual emissions. The Trump administration’s proposed changes would make it harder to trigger the requirement by adding an additional test: insisting that emissions also go up on a short-term, hourly basis – in addition to the annual surge. What the coal lobby is not telling you, however, is the human cost of their “longstanding dream.” Here is the short version from 538’s significant digits this last week. The cited NY Times article, Cost of New E.P.A. Coal Rules: Up to 1,400 More Deaths a Year, has more. The mortality numbers for the Trump administration plan are calculated using a modeling system reviewed by the National Academy of Sciences. You know what you can hurt? The administration’s own analysis, however, revealed on Tuesday that the new rules could also lead to as many as 1,400 premature deaths annually by 2030 from an increase in the extremely fine particulate matter that is linked to heart and lung disease, up to 15,000 new cases of upper respiratory problems, a rise in bronchitis, and tens of thousands of missed school days. Never mind. The trade-off is just what you would expect from Trump. Two other aspects of the new rule are noteworthy. One is that the Trumpians are passing off a global, planetary problem to individual states. California will have cleaner air. West Virginia? Not so much. At its heart, the administration’s Affordable Clean Energy rule will give individual states vast authority to set more modest goals and to regulate emissions from coal plants as they see fit. Critics assailed it on Tuesday as a shortsighted effort that could set back the effort to tame global warming. But that is just plain nuts. When it comes to the atmosphere, since when does Mother Earth respect arbitrary borders? Equally disturbing is the demotion of science in the Trumpian rewrite of the role of data in decision-making. The agency is considering a separate rule that would restrict the use of any study for which the raw, underlying data cannot be made public for review. The argument for the rule is that the research work isn’t sufficiently transparent if the data behind it isn’t available for analysis. But scientists overwhelmingly oppose the move, pointing out that participants in long-term health studies typically agree to take part only if their personal health information won’t be made public. The E.P.A. didn’t respond to questions about its proposal to limit the scientific research used in its assessment. “The Trump administration sees political value in this rollback, but our health and the economic promise of clean energy is at stake,” former Vice President Al Gore said in a statement. In addition, Steve Benen (MSNBC/MaddowBlog) is Coming to terms with just how dangerous Trump’s pollution plan is. [T]he hundreds of pages of technical analysis that accompany the new proposal indicate that emissions would grow under the plan. [Under the most likely projected scenario], the Trump E.P.A. predicts its plan will see between 470 and 1,400 premature deaths annually by 2030 because of increased rates of microscopic airborne particulates known as PM 2.5, which are dangerous because of their link to heart and lung disease as well as their ability to trigger chronic problems like asthma and bronchitis. This is the price Donald Trump and his team believe we should collectively pay to help support pollution from a dying industry. Some Trump voters may not have realized this is what they were endorsing in 2016, but it’s what they’re getting now. Cases in point: two people important to the investigations of Trump finances have been granted immunity. First, here’s a “significant digit” from the 538’s morning email. That was the lead story - until the prosecutors got to the Trump Organization CFO, Allen Weisselberg. Trump Organization executive Allen Weisselberg, who allegedly helped arrange hush-money reimbursement to Cohen, receives immunity reported Carol Leonnig and colleagues Devlin Barrett and Rosalind S. Helderman at the Washington Post. In that spirit I suggest a remake of 1987 film The Untouchables, retitled The Untrumpables. In the original film, in one of the most spellbinding scenes, Ness and Stone learn of the arrival of Capone’s accountant on the midnight train. The original was shot in Chicago’s Union Station. Ness and Stone battle Capone’s gunmen and secure The Accountant whose eventual testimony brings down Capone. For more on the original movie, TheUntouchables, see the denofgeek.com review. For a listing of the real Untrumpables assembled by Mueller, see this list from cheatsheet.com. Oh yes, about that 10-part series in November? Just kidding. The drama of this administration might be over by then. After delaying - and eventually preventing - hearings on Obama’s nomination of Merrick Garland to the Supreme Court, the Rethuglicans (aka GOPlins) have reversed course and are now rushing through confirmation hearings on Trump’s SCOTUS pick, Brett Kavanaugh. The millions of documents relevant to Kavanaugh’s beliefs and judicial history are being picked over and redacted by Republican lawyers or and even covered up. AZBlueMeanie at Blog for Arizona has an extensive report on A travesty of justice: GOP stonewalls on Judge Brett Kavanaugh documents while rushing his confirmation hearing. The Blue Meanie cited the NY Times editorial which asked Why Are Republicans Covering Up Brett Kavanaugh’s Past? and observes that For the first time in modern history, Senate leaders are refusing to request a Supreme Court nominee’s relevant papers. Something stinks. But is usually does when it comes to McConnell’s insidious dictatorial management of the Senate. Steve Benen (MSNBC/MaddowBlog) reports on one particularly revealing aspect of this rush to judgment - potentially a huge coverup perpetrated by the Senate GOP leadership and the White House. Benen reports on The meeting that changed Republicans’ minds about Kavanaugh documents. On July 7, just two days before Donald Trump introduced Judge Brett Kavanaugh as his Supreme Court nominee, the New York Times published an interesting report about the warnings the White House received from Senate Majority Leader Mitch McConnell (R-Ky.), who was well aware of the conservative jurist’s lengthy paper trail. The reference to Kavanaugh’s work as Bush’s White House staff secretary is important because it offers a behind-the-scenes peek: the Senate GOP leader apparently saw this part of Kavanaugh’s background as the sort of thing that would be scrutinized as part of a confirmation process. And yet, soon after, Senate Republicans agreed that this part of Kavanaugh’s professional background would be excluded from the Judiciary Committee’s document request. So what happened? Evidently, a White House meeting happened. Senator Patrick Leahy (D-Vt.), on Friday, asked White House Counsel Don McGahn for information on a pivotal July 24, 2018, meeting with Judiciary Committee Republicans that shaped their document request. Prior to the private meeting, Republican leadership seemed poised to request records that Judge Kavanaugh authored, generated, or contributed to as White House Staff Secretary. In an abrupt change of course after the meeting, Republicans refused to request any of Judge Kavanaugh’s records from his three years as Staff Secretary and Committee Chairman Chuck Grassley omitted all of Kavanagh’s Staff Secretary records from his request to the National Archives. Senator Leahy believes the American people deserve to know why certain staff secretary records were fair game going into the private meeting and off the table coming out. If the facts are as Leahy presents them – and as best as I can tell, no Senate Republican has contested them – it paints a rather alarming picture. As the story goes, GOP senators were prepared to consider this relevant period of Kavanaugh’s professional work, then there was a private White House meeting to which Democrats were not invited, and then Republicans decided to limit their areas of interest. One need not be paranoid to find this suspicious. I’ve seen some suggestions that Senate Democrats are making a strategic error by focusing on this and related procedural questions – the sort of areas that typical Americans have no interest in – rather than hammering away at the practical effects of Kavanaugh’s far-right legal vision. If Trump’s nominee has any chance of being derailed, the argument goes, it won’t be over procedural issues. Maybe not. But to make a compelling case against Kavanaugh, his detractors will need to scrutinize relevant elements of his background, and his tenure as Bush’s White House staff secretary is among the most important. For some reason, Senate Republicans and the Trump White House are eager to hide this part of the judge’s background – and only this part – from the public. To overlook this thread, or to suggest it’s not worth pulling on, would be a mistake. What, we should be asking, is in those documents covered up by the collusion between the White House and the Senate Republicans. And, yes, I pick my words carefully. Collusion. What will it take for Trump supporters to give him the boot? Consider: the Access Hollywood video didn’t come close to putting a dent in Trump’s standing. Consider: He rails against the First Amendment and his followers prove their adoration with chants against Trump’s claimed enemies like the press. So, Max Boot asks What will finally turn Trump’s supporters against him? Here, from Boot’s Washington Post column are possibilities along with answers to the question: will this finally bring Trump down? Let’s review what might have brought Trump down. What might prevent Trump’s tried-and-true Don Rickles strategy from succeeding? It won’t be the criticism he gets from retired security officials, which only feeds his crackpot conspiracy theories about the Deep State. It certainly won’t be criticism from the press; in one recent poll, 43 percent of Republicans want Trump to have the power to shut down news outlets “engaged in bad behavior.” I fear that even if an n-word tape is discovered, it won’t do the trick. As Jonathan Last argues in the Weekly Standard, Republicans are more likely to normalize the n-word than they are to turn on Trump. But at the end of the day, what would make the biggest difference would be an economic downturn. President Richard M. Nixon might never have been impeached were it not for the “oil shock” of 1973 and the resulting recession. While Trump might not care what newspaper editorial boards or even retired CIA directors think of him, he should care that two-thirds of business economists in a recent survey predicted a recession by the end of 2020. A growing economy has been the only thing saving Trump from a knock-out. He will hit the canvas for good if a bear market enters the ring. Max Boot, a Post columnist, is the Jeane J. Kirkpatrick senior fellow for national security studies at the Council on Foreign Relations and a global affairs analyst for CNN. He is the author of the forthcoming “The Corrosion of Conservatism: Why I Left the Right." About that “economic downturn”? Another conservative columnist, George F. Will warns that Another epic economic collapse is coming. … Sept. 15 will be the 10th anniversary of the collapse of Lehman Brothers, the fourth-largest U.S. investment bank. History’s largest bankruptcy filing presaged the October 2008 evaporation of almost $10 trillion in global market capitalization. I admit to being of Keynesian persuasion. Government has a role to play in managing the economy and controlling excesses of an otherwise unrestrained free market. However, there was no need for government borrowing to stimulate an already over-heated economy by a massive tax cut for the already overly wealthy. Please don’t dismiss this analysis as some mere conservative complaint. Remember that starting 40 years after the 1929 crash, economic inequality started an historic rise that persisted regardless of who sat in the White House and who controlled congress. That rise continues today. The only good thing there, as Boot predicts, is that a crash might be the only thing that will wake up, and wise up, the electorate to the excesses of this administration and it’s wanna-be king. Welcome to the Mournday Mourning Illustrated Gnus and other denizens of King Donald’s retinue revealed by AZBlueMeanie at Blog for Arizona. Here are some themes, memes, and falemes. Definition: a bit of fake news “copied (often with slight variations) and spread rapidly by Internet users”, often with ill intent. Usage: “Trump fans the falemes by calling the press ”the enemy of the people." Will Trump take over daily press briefings? You are primed to believe that. He’s already doing it. It’s called Twitter. Quote of the day defining truthmp: Truth isn’t truth. -Rudy Giuliani. Trump administration: consuming more oil is good for you. True (the quote, that is). “Conserving oil is no longer necessary for the economy” (headline from this morning’s Daily Star). Quiz: which is a reality TV show lowlife with zero credibility? (A) Omarosa (B) Donald Trump (C) Both (D) neither. Check Twitter for correct answer. Citing insecurity needs, Trump cancels all security clearances but one. “I can’t guarantee anything.” - Sarah Huckabee Sanders. She never could. There’s an old (or should be old) saying among scuba divers: You don’t have to swim faster than a great white shark. You just have to swim faster than your dive buddy. So it is with people leaving a troubled organization: You don’t want to be the last rat to leave the sinking ship. [John Dean to White House staffers: ‘Get out!’] reports “Aldous J Pennyfarthing” in the Daily Kos. John Dean knows a little something about awful, criminal, paranoid presidents with berserk rage boners for the popular Democratic presidents who preceded them. As White House counsel under President Nixon, he was deeply involved in the Watergate coverup. Eventually he flipped on the president, cooperating with investigators and pleading guilty to a single felony count. Come on, John. Worst in history? That’s … okay, yeah, you’re right. And unless we discover that James Buchanan nailed Stormy Daniels’ great-great-grandmother after she spanked him with a copy of Old Farmer’s Almanac, he’ll likely hold onto that status for a while. But this tweet does raise an interesting question. What could be a worse job to list on your résumé than White House staffer during the Trump administration? Steve Bannon’s personal bathtub attendant? I’d have to say those are all about on par with working for the Trump White House. In other words, it’s better to be the first rat off the sinking ship than the last. Think about that, okay? Over 70 former intel officers and leaders denounce Trump’s threat to revoke clearances reports Axios.com. In the 48 hours since President Trump revoked the security clearance of former CIA director John Brennan, over 70 former intelligence officers and leaders have come forward denouncing the president’s decision to revoke or threaten to take away security clearances from former government officials, including a list of 60 former CIA officers who signed a statement today, obtained by Axios. Go to the axios.com article for the full list of former CIA officers signing that statement. Two additional former officials, Admiral Denny Blair, former DNI, and VADM Bert Calland, former Deputy CIA Director also asked that their names be added to the list of former intelligence officials who signed a letter criticizing Trump’s decision to revoke Brennan’s clearance. Senate adopts resolution backing free press after Trump attacks. You can read the full text of the Senate resolution here. The vote comes after more than 300 hundred U.S. newspapers on Thursday launched a coordinated defense of press freedom and a rebuke of President Donald Trump for denouncing some media organizations as enemies of the American people. “A central pillar of President Trump’s politics is a sustained assault on the free press,” said the editorial by the Boston Globe, which coordinated publication among more than 350 newspapers. At a Senate hearing, Federal Communications Commission chairman Ajit Pai again said he did not agree that the press was “the enemy of the people” but declined to offer a view of Trump’s anti-press rhetoric. The White House did not immediately comment on the Senate action. And then there are the Omarosa tapes: Omarosa Might Have ‘As Many As 200’ Tapes, NY Times Reports reports the Huffington Post. The former aide to President Trump has released several audio recordings while promoting her new book. Omarosa Manigault Newman may have an archive of up to 200 secretly recorded audio files from her time working in the White House, The New York Times reported Thursday. The former aide to President Donald Trump has released several such recordings over the past week, which have reportedly left officials in the administration “rattled,” according to the Times. Manigault Newman on Thursday released the latest tape, which she said included a discussion in which the president’s daughter-in-law, Lara Trump, offered her a $15,000-a-month job with the 2020 Trump re-election campaign. The clip was played on MSNBC, and Manigault Newman later suggested that the offer came after she was fired in December as an effort to buy her silence. Manigault Newman, in the midst of a press tour to promote her book, Unhinged: An Insider’s Account of the Trump White House, says she did not accept the offer, which included a provision that she sign a nondisclosure agreement. Other tapes released in recent days include audio of her being fired by White House chief of staff John Kelly and one of the president speaking to her after her dismissal. The Trump campaign has taken legal action against Manigault Newman over her release of the clips. But it’s in his jeans (or genes): Trump sues people almost as often as he lies about them. “I hope it’s all worth it for you, Omarosa, because some things you just can’t put a price on,” she wrote. Things like “that dog” perhaps? Priceless. These are the newspapers telling Trump that journalists are not the enemy reports CNN.com. Here are some of the newspapers blasting Trump’s anti-press rhetoric. Like I said, this has not been a good week for Trump. The New York Times reported that Trump Cancels Military Parade, Blaming Washington Officials for Inflating Costs. Once again, the loud sounds emanating from the Scriber household, like combinations of hysterical laughter and gagging, were triggered by the last part of that headline. Washington’s mayor, Muriel E. Bowser, pushed back on Twitter, saying that she had “finally got thru” to the president to convey the “realities” of what it costs to stage events like military parades in the city. Ms. Bowser put the number at $21.6 million, though the city’s costs are just a fraction of the total, with federal agencies also kicking in millions of dollars. A day earlier, the Pentagon said Mr. Trump’s parade to celebrate the military could be postponed to 2019, as officials acknowledged that the event could cost more than $90 million. Moments ago we got the news: Donald Trump’s military parade has been canceled. We’ll learn more in the coming days about what the final straw was, but we know this: our pressure worked. We pushed tens of thousands of petitions, calls and letters to Congress from veterans and military families urging them to stop this international embarrassment. And they felt your pressure. We stopped it! We did it! What a collective effort! So will your Scriber (a Vietnam era vet, 3 1/2 years Army Security Agency - bone-spur free). But perhaps there is another way to sate Trump’s appetite for self aggrandizement. WASHINGTON (The Borowitz Report)—The Pentagon has turned down Donald J. Trump’s request for a grand military parade in Washington, D.C., citing a sudden outbreak of bone spurs that would prevent men and women in uniform from participating. Harland Dorrinson, a Pentagon spokesman, said that, within an hour of Trump’s request, more than a hundred thousand military personnel complained that they were suffering from acute cases of bone spurs that would make marching in such a parade a painful ordeal. Pence Stages One-Man Parade in Honor of Trump. So, you see, Trump needs that parade even if it is only Mike Pence groveling his way down Pennsylvania Avenue. And about that dog business? I commend to you this essay on dogs by Chicago Tribune columnist Rex Huppke (reprinted this morning, 8/17, in the Daily Star: A dog’s letter to President Trump: Stop calling humans ‘dogs’. Here is a little bit of it from Zoe, smart and full of love, to a president who is neither. I do not usually pay attention to human politics. I prefer more pleasant things like sniffing my friends’ butts or rolling on a dead bird in the backyard or eating things that will make me throw up. Anyway, I am writing because I have noticed that you keep comparing human beings to dogs. … dogs are wonderful and intelligent and filled with love, and I do not think you were trying to call Omarosa or Mitt Romney or Ted Cruz or any of those other humans wonderful or intelligent or loving. I think you were trying to be mean and insulting to them. And that makes me want to growl at you. Bad large human president! Bad! I understand you are the first president since William McKinley to not have a dog. That’s weird. You don’t have any animal friends, and that makes me suspicious.